CH Technologies Fidas® 100 has been developed for the reliable measurement in indoor locations of PM1, PM2.5, PM4, PM10, and TSP. For workplace measurements, particles of up to 100 µm can be collected and measured using the Fidas® 100 combined with a sampling head Sigma-2 (VDI 2119-4). 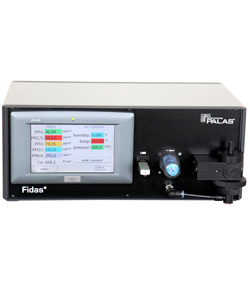 For the emission measurements in exhaust air channels, the Fidas® 100 can be connected with an isokinetic sampling probe. The instruments can also measure the time-resolved particle concentration and the particle distribution in the particle size range from 0.18 - 18 µm (optional 0.5 to 40µm or 2 to 100µm).